The great thing about working in a team is the ability to bring together a bunch of different people with different skills, perspectives, and energy. However, often we are working in a group that is not actually functioning like an effective team. Think about the last idea that your group worked on. Who initially shared this idea with the group? After they shared it, how did the idea change, build, expand, … ? Did each team member weigh in on the idea or add to it? Was the idea questioned, held up, and closely examined from the different perspectives of each of your team members? If the idea has remained fully intact between when it was first pitched to now, then your group is not functioning like an effective team. Your group is not living up to its potential. Ideas are getting through without the rigor that a high performing team can provide and are therefore not as well designed as they could be. The first step is to be aware – recognize when your group is not functioning well and bring it to the other team member’s attention. From there, you can try a different meeting design to encourage everyone to get more engaged in the group. 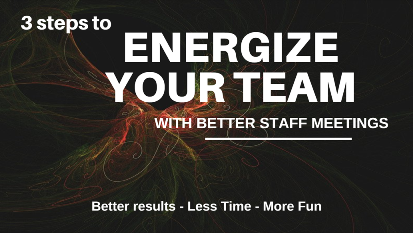 The 3 Steps to Energize Your Team with More Productive Staff Meetings Toolkit is a good starting point to re-invigorate your team meetings. You can download the toolkit for free below.